Souleymane Traoré is a balafon player and singer who performs under the name of Neba Solo. In 1996 he was named "Malian artist of the year" (Oumou Sangaré had been the previous winner) and his success represented a new direction in Malian popular music. 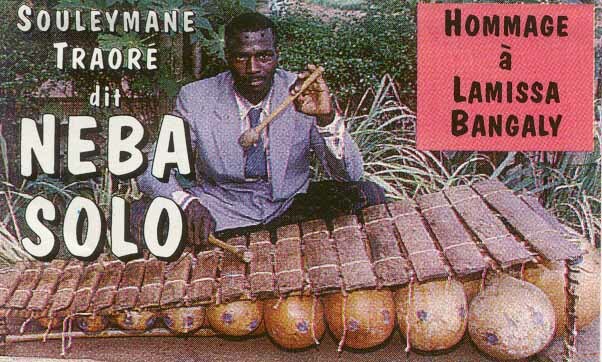 Traoré plays the balamba, the largest instrument in the balafon family, and his musical style owes much to the traditional forms of balafon instrumental music. His style has been proudly labelled as "farm music", and it represents a bold move away from the high-tech Paris-based recordings of some of the bigger Malian stars. Traoré's music is firmly based in the roots of the region of Sikasso. Percussionists would love the dense polyrhythmic textures of balafons and traditional drums. It's a potent mix, capped off by Traoré's vocals treated with a generous amount of reverb. It's a great recording. Souleymane Traore has at least four recordings available - "Confirmation", "Hommage à Lamissa Bangaly", "Kénédougou Foly", and "Kene Balafons".